Photos by Sara Wickham (left) and Jenn Burt (right). 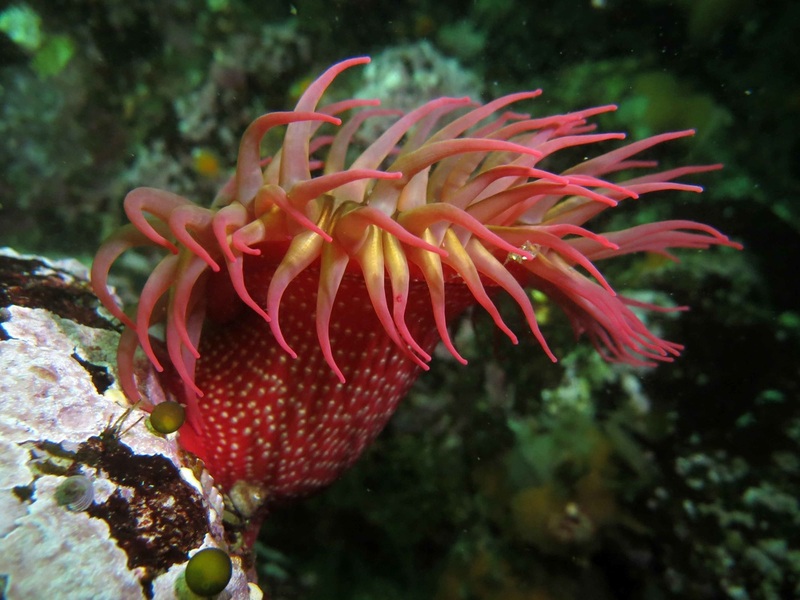 The white-spotted rose anemone has a stout dark red to reddish-pink column marked by many white spots (smooth papillae) aligned in vertical rows. The column colour may vary - it is occasionally lighter pink or almost white - but the vertical lines of white spots are a key distinguishing feature. The tentacles are long and slender, with yellow-tinged bases and pinkish tips. This species grows to 15 cm in diameter as well as in height. 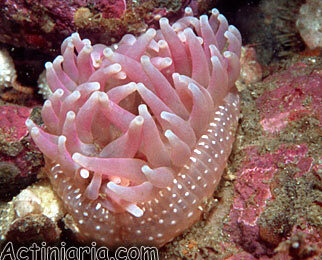 The white-spotted rose anemone is mainly a subtidal species, though it can be found in low intertidal areas. It attaches to rocks, pilings, and floats in the subtidal; in the intertidal it is most often found attached to vertical rock faces and in surge channels. 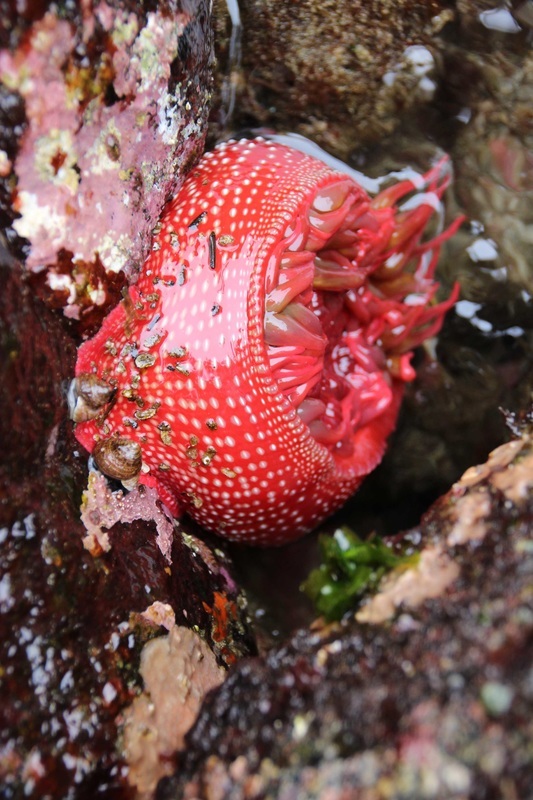 It inhabits outer exposed coastlines from northern Alaska to southern California. 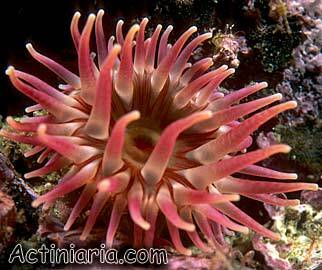 This species is often incorrectly called Urticina lofotensis - this name is actually a synonym for an Atlantic species, the valid name for which is Urticina eques. Click here for more information. The white spots are actually sticky tubercles and may have shell fragments and sediment stuck to them. Cowles, D. (2006). Urticina lofotensis (Danielssen, 1890). Invertebrates of the Salish Sea. Rosario Beach Marine Laboratory. Accessed 07/11/2014. Sanamyan, N.P., Sanamyan, K.E., and Schlories, D. Cribrinopsis albopunctata Sanamyan et Sanamyan, 2006. 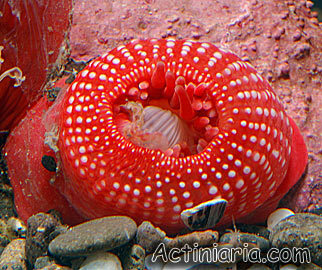 Actinaria.com. Accessed 07/11/2014.